The sensation of numbness, tingling or pain in your left arm could be a minor annoyance or it could indicate a serious medical condition. Depending on the cause of left arm numbness or tingling, just the upper part of your left arm, wrist, or hands may be affected. In other cases, you may lose sensation in your whole left arm. In most cases, the “pins and needles” feeling down your left arm that may or may not result in numbness isn’t usually anything to worry about. Losing sensation in your left arm may be because of something as simple as sleeping on your arm, poor circulation, or a minor injury. In these cases, the abnormal sensation is usually temporary and feeling will return when the underlying cause is resolved. However, sometimes numbness, tingling, and pain in your left arm could be an indicator of a more serious condition like a heart attack, stroke, or a side effect of diabetes. Serious medical conditions that cause loss of sensation in your arm will always be accompanied by other symptoms, and the tingling alone won’t usually indicate a life-threatening situation. 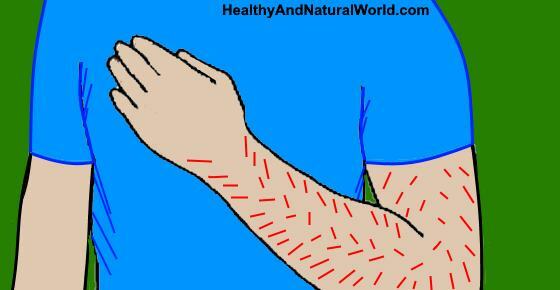 In this article, you will learn about the various causes of left arm numbness and tingling. In some cases, you will find out how to resolve the prickly sensation in your left arm and if numbness in all or part of your left arm is something to worry about. Numbness and tingling in your left arm are usually caused by nerves in your shoulder, back, or arm getting compressed. This can cause a burning feeling that tingles down your left arm from your shoulder to the tips of your fingers. A prickly burning feeling could also be the result of blood vessels getting compressed for a period of time. When circulation returns to the affected arm, you will often feel tingling and itching as the numb sensation disappears. If you have permanent or recurring left arm numbness, your doctor will look at other symptoms. For example, your doctor will want to know how far the tingling sensation goes down your arm and if you also have tingling in your right arm. If the loss of feeling in your arm is due to an injury, the doctor will check for damage to ligaments and bones. Of course, if you experience any kind of sudden loss of sensation in your arm along with chest pain and discomfort, you should visit your doctor promptly. Let’s look at the different reasons for a loss of sensation in your left arm that results in numbness and tingling. One of the most common reasons for temporary numbness and tingling in your left arm is falling asleep on your arm. Sleeping in the wrong position with your arm under your body can also cause shoulder pain while sleeping. Falling asleep with an arm over the edge of a chair can also result in waking up with a numb arm. Sometimes, waking up with a numb arm is called “Saturday night palsy” because a person falls asleep with their arm pressed against the arm of a chair after drinking too much alcohol. Or, it can be called “Honeymoon palsy” because your partner has slept on your outstretched arm resulting in arm tingling or numbness when you wake up. Damage to a nerve caused by an injury to your left arm or left shoulder could cause a loss of sensation or tingling in that arm. Depending on the severity of the arm or shoulder injury you may have complete loss of sensation in that arm. Minor injuries may only result in a prickly sensation. If you have injured your arm, you can help relieve the symptoms by using the R.I.C.E. method for pain relief. For more information on how to relieve the symptoms of an arm injury, please read my article on effective natural treatments for relieving arm pain. A compressed nerve in your wrist caused by injury, repetitive work or arthritis could cause numbness in your arm and wrist. Carpal tunnel syndrome describes a condition where the nerve that runs from your forearm to your palm becomes squeezed. Sometimes, you may also have pain in your arm, wrist, or fingers. Pinched nerve in your spinal cord can cause numbness and tingling in your left arm. According to Dr. Melinda Ratini on WebMD, damage to nerves in the neck region of the spine (known as the cervical spine) can cause cervical radiculopathy. Certain medical conditions can cause poor circulation in which blood vessels in your arm become narrow and result in tingling in one or both arms. Your heart pumps oxygen-rich blood around your body to nourish the body’s tissues. If circulation is poor, you may get tingling in your arms, hands, legs or feet because of reduced blood flow to these body parts. To help improve blood circulation to get rid of tingling in your arms and restore sensation, you should stop smoking, enjoy a healthy diet to help reduce cholesterol levels in your blood, and looking after your heart. Another circulatory problem that can cause tingling, numbness, and a cold sensation in your left arm or right arm and hands is Raynaud’s syndrome. Doctors don’t know what causes Raynaud’s syndrome but some autoimmune conditions like rheumatoid arthritis or lupus can sometimes be to blame. Diabetic nerve damage that results in a feeling like your skin is “crawling” or numbness in your left arm or right arm could be aggravated by carpal tunnel syndrome, autoimmune conditions, high blood glucose, or damage to blood vessels. If you have diabetes, it’s important to look after your health and manage your condition properly. Some doctors recommend managing diabetes with a healthy diet to help keep your blood sugar levels in check. There are also many lifestyle changes that can help prevent diabetes or prevent the condition worsening. Another life-threatening condition that can cause numbness or a prickly sensation in one arm is a stroke. As with a heart attack, numbness in your arm itself won’t be the only symptom but it will be accompanied by other serious signs. Apart from the above-mentioned reasons for numbness or tingling in your left arm, there are other conditions that can cause abnormal sensations in your arm. Numbness in your left arm could be one of the many symptoms of a heart attack. Because your heart is located on the left side of your body, cardiac arrest or heart attack usually causes pain and discomfort on that side. Sometimes it can be difficult to distinguish the cause of left sided chest pain, therefore doctors generally advise that you seek medical advice for all new and sudden chest or arm pain. To prevent a heart attack, you should exercise regularly, enjoy a healthy well-balanced diet, and limit alcohol consumption. You should also take steps to lower your blood pressure naturally and shed extra pounds if you are overweight. Most cases of numbness and tingling in your left arm are only temporary and are quickly resolved, especially if the cause of tingling is due to a pressed nerve or blood vessel. However, in some instances, acute sudden tingling or numbness in your left arm can be a cause for concern. This can be true if the abnormal sensations in your arm come and go or you have a constant numbness or prickly sensation in your arm. WebMD. Causes of pins and needles. eMedicineHealth. Shoulder problems and injuries. Arq Neuropsiquiatr. 2012 Apr; 70(4): 252–256. Thank for the information on different pains which causes numbness in arms and fingers. I have cervical spondylosis and numbness in the fingers. Which also caused difficult in walking and my knees paining even failing to kneel down. I have been on medication and told to puton a cervical collar. Does it means i will take medication for the rest of my life? Which medication can i use to improve in walking and be able to go upstairs as a normal person? Hi Grace, I’m not a doctor but from what I’ve seen in medical websites, cervical spondylosis describes age-related wear and tear that affects the spinal disks in the neck. It is a very common condition and worsens with age. According to Mayo Clinic, sometimes there is narrowing of the space in the spinal cord and the nerve roots that pass through the spine to the rest of the body, and in this case you can fee numbness in your fingers. You can have a look in Mayo Clinic about treatment options, but you will need to discuss with your doctor the best treatment plan according to your specific condition. It depends where the injured discs are. In my article about Pinched Nerve in Shoulder I mentioned that along with pain in your shoulder blade, you may have a sensation of tingling or numbness in your shoulder, arm, or hands. The tingling sensation may come and go or become persistent. So when the pinched nerve is in the cervical spine (which is the upper part of your spine), tingling is felt in the scapula (shoulder blade) and the arm. When the disk problem is in your lower spine (lumbar spine) and puts pressure on a nerve root, it can cause pain that radiates down the back of your leg.